There's the unique double role played by the newly crowned king of the welterweights — the boy who conquered the great Mickey Walker. For the last six years, this 23 year-old product of the coal mining region has worked the two way shift. One of a family of eight, he comes of fighting stock. Three brothers before him were professional ringsters, but only one, Steve, made much headway in the game. None progressed so sensationally as Peter, however, who. 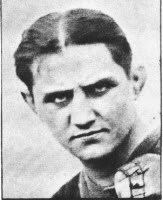 ; in his first bout in 1919, fought; under the name of Young Clancy, because the Latzo name at that time was not regarded as an impressive nom de ring. 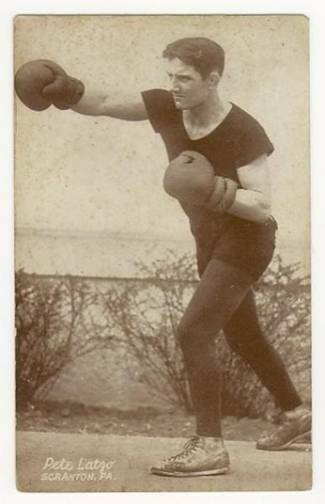 As Young Clancy, Pete copped, his first battle, knocking out a fellow named Red Ferguson in three rounds. He followed that success by scoring three more kayoes in rapid and decisive fashion. His early achievements then induced him to tight under his real name of Latzo. The youthful Scranton youth has climbed the pugilistic ladder rapidly during the last three years. True, he was decisively whipped by Mickey Walker a few months after Walker won the welter title by edging the aged Jack Britton, but that proved only an incentive for Pete to get back in the running again. The interesting and decidedly unusual part of Latzo's ring career is that he's never failed to lick an opponent that had previously defeated him. He's a scrapper without a jinx. Two years ago he fought the strong Willie Harmon in New York – and lost. A few months later Pete handed Harmon a fancy trimming at Scranton. The same is true of Latzo’s scuffles with Frankie Schoell and Paul Doyle. In the case of Doyle, Pete was licked right in his home town after a sensational battle. Boston put in a bid for their services and Latzo came through victoriously. George Ward, a good mauler, has dropped three battles to Latzo while the renowned Dave Shade lost one decision and was given a draw in another bout with the Scanton miner boy. Pete is classed with the best in the anthracite field. He plays second base and the outfield. Pete is under the management of Paddy Mullins, who also looks after Harry Wills. Wins Decision Over Pete Latzo by Margin of One Round. WILKES-BARRE, July 16.—While rain hovered in the sky and seats and the ring alike sogged under an early downfall, pudgy Pete Latzo. pride of this anthracite mining center, battled with all the viciousness and pride of a kid fighting in his own back yard but in vain—tonight for Tommy Loughran's light heavyweight championship. Game as his stand was, furious as his gallant attack, the brown skinned youth was forced to bow for the second time this season to the mastery of the Philadelphian. By the narrowest of margins was one of the most vicious skirmishes of the. outdoor season decided in Loughran's favor after ten rounds of the kind of milling that had even the spectators, bitter partisans in this all- Pennsylvania struggle, fighting among themselves. The Associated Press score card gave Loughran five rounds with four for the challenger and one even. A little over two months ago, Latzo. once the welterweight champion, but now grown to a full-fledged light heavyweight, battled Loughran on almost as even terms in a 15-round go in Brooklyn. .And tonight, as then, the gameness and plunging, two-fisted attack of the challenger carne within an ace of stripping Loughran of his crown. 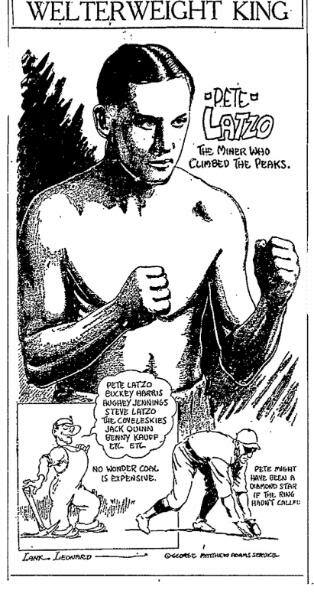 Remembering that fight and hoping for the best, the miners who trooped to Scranton two years ago to see Peter, then a lithe 147-pounder, batter Mickey Walker's welterweight crown into the shape of his own head, flocked out tonight to honor the former breaker boy and cheer him to victory. But with honor in his grasp and Loughran fading before him in the third and fourth rounds, Pete found that he had wasted too much strength in his rushing assault. Then it was that Loughran took a fresh hold, and stabbed out the decision over his closest rival in the 175-pound division. Rallying in the middle rounds, Tommy boxed his way to enough of an advantage to hold Pete off again when he stormed the championship citadel with a final desperate rally in the last two rounds. Boxing as cleverly as he ever has, Loughran had. Latzo totally at sea in the first round. Again in the second, the champion, boxing like a well-oiled machine, poured a flood of gloves into Pete's face that had the miner constantly gnawing the leather of his left hand. It mattered little that Latzo, after letting the next three rounds drift to Tommy with the eighth even, rallied in the final two sessions, whaled into Loughran with new vigor and again cut his eye and cheek. The effort was too long delayed. The champion had retained his title by the margin of a single round and the coal regions must wait for another champion. The crowd of approximately 15,000 paid $60,000 to see the show. Promoter Morgan Bird was reported to have paid Loughran $25,000 to defend the title while latzo received $7,500.